Drones are commonly used for remote image capture. The cameras on hobbyist and DIY drones tend to be of modest quality, but they are certainly good enough to capture images of trees, bushes, and fruit, usable for spotting and monitoring. These digital photos, or frames extracted from digital video, can then be analyzed using imaging technologies. These imaging technologies can provide information regarding the relative health of the plants and may also be used to identify and count fruit on trees or bushes. In our research we have experimented with the use of ImageJ and Infragram: both open imaging technologies that are freely available. ImageJ is an open source, Java-based image processing program. It can be run as an online applet or as a downloadable application. ImageJ comes bundled with a set of common imaging functions that can used to analyze the images captured by drones in the context of foraging. For example, threshold filters can be used to identify possible fruits in an image. Particle analysis functions can then be used to count the number of objects (e.g. fruit) in an image. Although the imaging functions are not always accurate, they can be used for rudimentary spotting and monitoring. 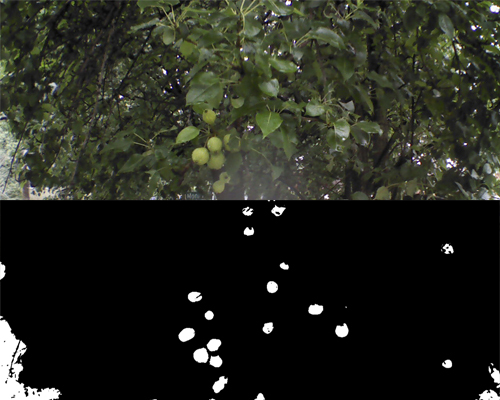 A manual for the use of ImageJ as an application for finding and counting fruit in images in the context of foraging is available for download. The Infragram is a digital camera that has been modified to be an infrared camera, developed by The Public Laboratory for Open Technology and Science (aka The Public Lab). The typical use of the camera is to take photos of plants to measure their health. The Public Lab has documented a wide range of uses of the camera and provides software for NDVI image analysis: an image analysis technique useful for gauging the relative health of plants. The Public Lab project website lists a couple of variations of the Infragram (http://publiclab.org/wiki/infragram). With a simple hack, a camera capable of capturing NDVI images can be mounted on a DIY or hobbyist drone. One could also modify the existing cameras on a DIY or hobbyist drone. NDVI software can then be used to analyze images of fruit trees and bushes to assist foragers in accessing the relative health of the fruit. A manual for the use of the Infragram and NDVI imaging in the context of foraging is available for download.